I have now had this blog over 7 years. I like the name and therefor I am planning to keep it. I have started several other blogs in german, swiss-german, swedish, english and so on, but the only one that has actually lasted is this one. When I started blogging on october 30 2006 in Sweden it was kind of a hype. Everyone was blogging. Everyone was reading their friends blogg even when they lived next door. That was when facebook started booming and it was when most of the people surrounding me were Swedish, at least those who were interested in reading my "open diary". Back then I was very openhearted and private in my blog, but it was more of a diary back then and not a news blog as I want it to be now. Sometimes it feels as if I haven't moved on at all since that fall 2006 when I sat in my students room in Örebro. All alone for the first time. The whole world ahead of me. I wasn't even 20 years old then and now I'm closer to 30 than 20. Don't get me wrong, I wouldn't trade a single moment of my life. Everything has had it's reason and I've always made conscious decisions. And even though it feels as if I haven't moved on, I know that I have come quite a long way. I am still scared at times, I still doubt my own capability and I often feel like 19 years old... but I have learned to overcome fears, I have learned to handle the doubt, my experience has shown me that I will do fine, whatever I do and no matter how hard it feels. It turns out fine and if not, it is an other experience and not ment to be. If I fall, I get up again. I realised I need writing and even though english is not one of my hearts languages, it is the simplest way to keep all these wonderful people in Sweden, Germany, Switzerland, France, England, Belgium, Austria, USA, UK, Italy, Australia who would like to follow me and read about my life up to date. It's mainly for my friends, but I will keep it suitable for official purposes too as one never knows who might stumble up on it, and where my life might take me. By the way, when I started this blog seven years ago, I had buried my dreams of a professional stage career long ago, and decided to become something "decent" and "normal". I had made up my mind to follow an "average" academics life with studies, some year of work, and when I was 30 I was supposed to have at least two kids, be married, live in a house with a Volvo and a dog. I don't judge that life at all, I think every individual human being should do what she/he wants to and what makes her or him happy. But nobody should live their life in a way that isn't theirs. One night I dreamt that I was 40, I had dropped off my three kids at school, been out with the dog, the house tidy and neat. I sat down and felt so sad and so empty. I had missed my life. "What if?" was the phrase that popped into my mind. What if? I didn't even try to live my dream. What if I had acually been good enough? What if I would have actually succeeded? I will never know, because I never tried. And then I saw myself hanging from the bathroom roof. And that was when I realised I had to try. At least give it a shot. Afterwards I would know. And if it wouldn't have worked out, I would at least have my peace. So I tried. And now, here I am. Earning my livelihood by doing what I love most. I will probably not get rich. Not money-rich. But personality-rich. And happy. Half a year, when I wrote the last article here I had a real low. I was close to taking a pin and popping that soap bubble. But turned out it was no soap bubble, it didn't burst. I pulled my self out of the dust, got up, and went on. I got active. I started doing loads of things, and I don't believe in "The Secret" but something out there rewarded me for trying and going on. 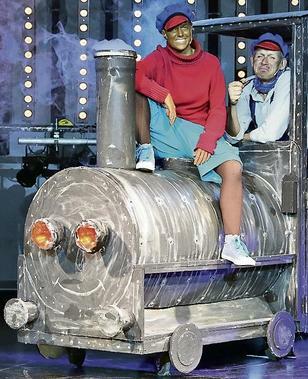 I have grown a lot since april and from monday on I will play the main part in Germany's most well known childrens musical: Jim Knopf und Lukas der Lokomotivführer (Jim Button and Luke the Enginedriver). For that I moved to Hannover yesterday. And now again I am sitting here in a city I do not know yet, quite alone, but I'm fine. This is how my life will probably always be. At least from time to time. Then it's good I share my life with an other artist, we understand each other, we know what monsters the other is fighting, we know how it feels and we knew we would have to be apart from time to time from the beginning. It's always painful when you can't be with the one you love, but knowing he will be there when you come back, makes it bearable. I will try to keep you updated about what I do here in Hannover and after that what happens in my life and what a newcomer actress' life looks like. This photo is from the press conference on 2013-10-15 at GOP Variete Theater Hannover, where we will also be playing. Thomas Wißmann is playing Lukas and I am Jim. Oh, and the locomotive's name is Emma.